Colliding black holes create space-time ripples that can be seen by the Laser Interferometer Gravitational-Wave Observatory (LIGO). The science collaboration responsible for the first-ever direct detection of ripples in cosmic space-time has been recognized by two publications for its monumental achievement. The Laser Interferometer Gravitational-Wave Observatory (LIGO) was built to detect gravitational waves — a phenomenon that was originally predicted by Albert Einstein in 1915, in a theory that says that space and time are part of the same cosmic fabric. In February 2016, the members of the LIGO team announced that they had succeeded in their quest: They had picked up space-time ripples that were coming from colliding black holes. A second detection was announced in June. Physics World, the science periodical that is produced by the U.K.-based Institute of Physics, announced today (June 12) that it has awarded LIGO its 2016 Breakthrough of the Year award. In addition, the LIGO collaboration was placed on the year-end list of Global Thinkers that is produced annually by the U.S.-based magazine Foreign Policy. The Foreign Policy Leading Global Thinkers list highlights individuals or groups "whose ideas have translated into action over the past year, thereby changing and shaping the world we live in," according to a statement from the Albert Einstein Institute in Potsdam-Golm, Germany, where some of the LIGO collaboration members are based. 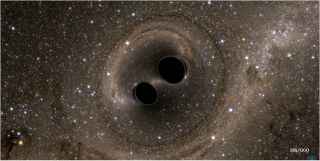 The LIGO collaboration has also been recently awarded the 2016 Gruber Cosmology Prize by the Gruber Foundation (co-sponsored by the International Astronomical Union), and the Special Breakthrough Prize in Fundamental Physics by the Breakthrough Foundation, which includes a $3 million award.